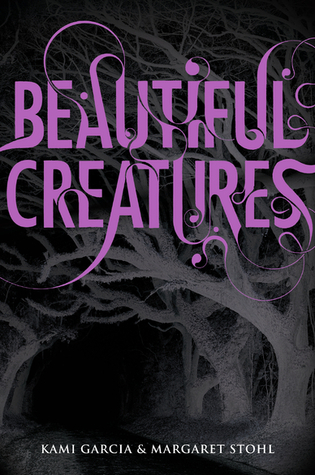 Presenting Caster Chronicles #1 Beautiful Creatures by Kami Gracia & Margaret Stohl. Lena and Ethan become bound together by a deep, powerful love. But Lena is cursed and on her sixteenth birthday, her fate will be decided.Ethan never even saw it coming. Reading this way later after seeing the movie first, I definitely say I like the book better. The movie was okayish but now that I have finally read the book, audiobook and ebook simultaneously, I am obliged to report that I am sad they cut and changed a lot of good things to accomodate in the movie. I know excellent book to movie transitions are hard to come by and I know that translating 500 pages (as such) pages to a 2 hour movie is not easy but still sad because the book conveys they story way better than how the movie tried it. An enticing, and a lush dark gothic plot. Beautiful Creatures offers a unique, new and an attractive tale of witches..... Casters as they are called set in small town Gatlin, in the southern countries. A largely overdone plot but with something different this time. Instead of the perspective of the female lead, as is popular for the genre. The story follows the narration from the male lead Ethan Wate. Bringing a well developed and culturally rich story to us readers (with some cool American Civil War history included). Ethan Wate and Lena Duchannes form the lead pair to our story. Ethan was rather an interesting fellow. Life in a small town can be very monotonous. Everybody knows who you are, what they expect you to do and what your place is. And Ethan will do everything he can to break through such bonds. A creepy..... creepy song. With the definite haunting and since I was listening to the audiobook as well..... Well I was thoroughly spooked. Definitely not happy they cut it out from the movie. Lena Duchannes. She sweeps into small town Gatlin and takes everyone by surprise. She is the niece to Macon Ravenwood, the resident County recluse and she is definitely not something you would say normal for Gatlin. She has no interest in what the average person do and strange incidents like window exploding, thunderstorms, room arrangement changes and mind talking with the person you love. Ethan feels a certain level of attraction towards this strange new girl. An intense and strong attachment that even Lena who was hesitant at first could not ignore. Ethan was truly accepting of Lena and her strangeness. I quite liked it that Ethan goes head first and discovers the Caster history and the ancient connection that he shares with Lena and is prepared to fight the world, if it means that Lena is safe. I'd say it again you don't get this type of different very much and I loved how Kami Garcia and Margaret Stohl brainstormed such an enticing tale..... The movie was a disappointment but I am definitely going to continue reading this extravaganza because I am excited to see what happens at the 17th Moon. "A dark gothic love story with a unique curve"
Wow. Definitely a weird, haunting song. I never even heard about this! But I read it in the book. :) Great review!